WASHINGTON, D.C. -- The percentage of Americans expressing high confidence in the U.S. Supreme Court is steady and relatively low, with 37% last month expressing "a great deal" or "quite a lot" of faith in the nation's highest court. The latest reading was recorded June 1-13, before the end of the court's 2017-2018 term, which included highly publicized rulings on President Donald Trump's "Muslim ban," crisis pregnancy centers and union obligations as well as Justice Anthony Kennedy's retirement announcement. It marks the 14th consecutive year that the high court's confidence rating has been below its historical average of 44%. The current results are based on Gallup's annual update to its confidence in institutions trend. The measure ranks U.S. institutions based on the combined "a great deal" and "quite a lot" confidence scores. The Supreme Court ranked well below the military, whose 74% high confidence rating from Americans is the highest of the 15 institutions tested. The largest share of Americans, 42%, express "some" confidence in the Supreme Court, and 18% say they have "very little" or "no" confidence. Although the presidency and the Supreme Court have identical 37% high confidence ratings, the presidency has a 44% low confidence rating. With just an 11% high confidence rating and a 48% low rating, Congress is regarded as the worst of the three branches of government (and all of the institutions) by far. 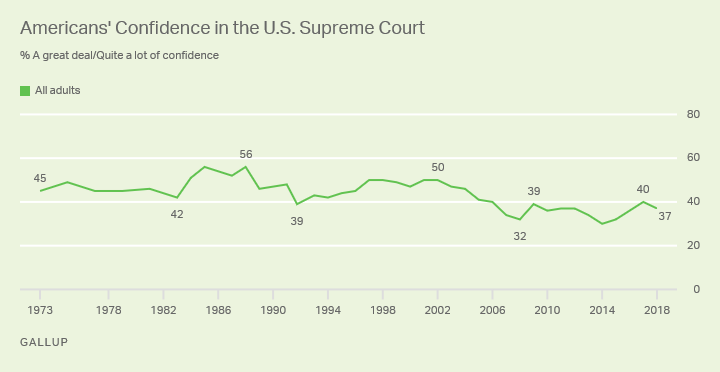 The highest confidence ratings for the Supreme Court since 1973, when Gallup first asked about it, were two 56% readings in 1985 and 1988, at the end of Chief Justice Warren Burger's term and the beginning of William Rehnquist's elevation to the lead role. Confidence in the court has become more politically polarized over the past two decades. At this point, 44% of Republicans and Republican-leaning independents have a great deal or quite a lot of confidence in the court, compared with 33% of Democrats and Democratic leaners. The highest confidence reading among Republicans and Republican-leaning independents, 61%, was in 2001 after the Supreme Court's decision in Bush v. Gore effectively made George W. Bush president. The 18-percentage-point partisan gap in confidence after that decision is the largest in Gallup's trend. Throughout Bush's presidency, the confidence levels of Republicans and Republican leaners outpaced those of their Democratic counterparts. Likewise, during nearly all of Barack Obama's presidency, Democrats and Democratic-leaning independents registered higher levels of confidence in the court than their Republican equivalents. The exception came in 2012, when Republican high confidence was 44% and Democratic was 33% before the ruling that unexpectedly upheld the Affordable Care Act. When one looks at fluctuations in confidence over the years, a president's political party and the justices he has appointed appear to affect the public's views of the nation's highest court as much as the decisions it hands down. Most recently, since Trump took office and his nominee, conservative Justice Neil Gorsuch, was confirmed, Democrats and Democratic leaners have lost confidence in the Supreme Court. Between 2017 and 2018, their high confidence level has dropped 10 points. At the same time, Republicans and Republican leaners have become increasingly confident, to the tune of a 15-point surge in two years' time. Americans' views of the Supreme Court have generally been lower in recent years than in the 1970s, 1980s and 1990s, mirroring declines in the public's confidence in most major U.S. institutions over the same time. Attitudes have also become more polarized. Depending on future court decisions, it seems highly possible that the latest 11-point gap between Democrats' and Republicans' confidence in the Supreme Court will grow in the next few years of the Trump presidency. In the weeks since Gallup measured the latest confidence ratings, the Supreme Court handed down several decisions that have drawn Democrats' ire. In the aftermath of these decisions, Kennedy's surprise announcement that he was retiring only troubled rank-and-file Democrats and party leaders more. Trump's nominee to replace Kennedy is likely to be a staunch conservative, which will do nothing to inspire confidence in the high court from Democrats. 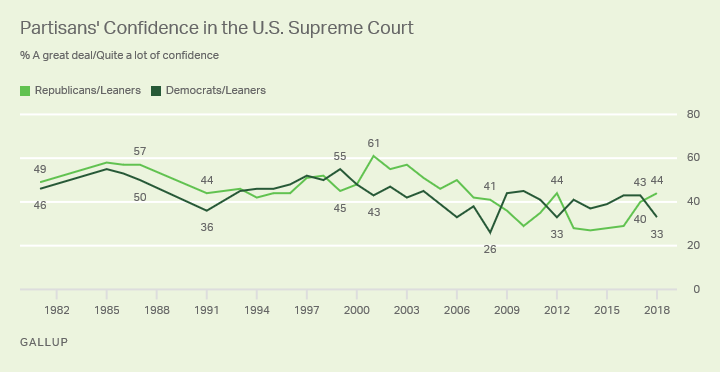 To date, Democrats' lowest confidence rating for the Supreme Court was 26% in 2008, as Bush's presidency was drawing to a close. The next year could conceivably see Democrats' confidence sink lower than that. President Donald Trump's job approval rating fell back slightly last week, to 41%, down from a personal high of 45%. 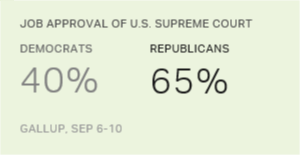 In the past year, Republicans' job approval rating of the Supreme Court has surged from 26% to 65%, while Democrats' rating has plummeted from 67% to 40%.